This set of four napkin rings features lovely beaded edges. These napkin rings are larger than our standard 1601 rings, with a diameter of roughly 2 inches, when measuring from the outside of the ring. 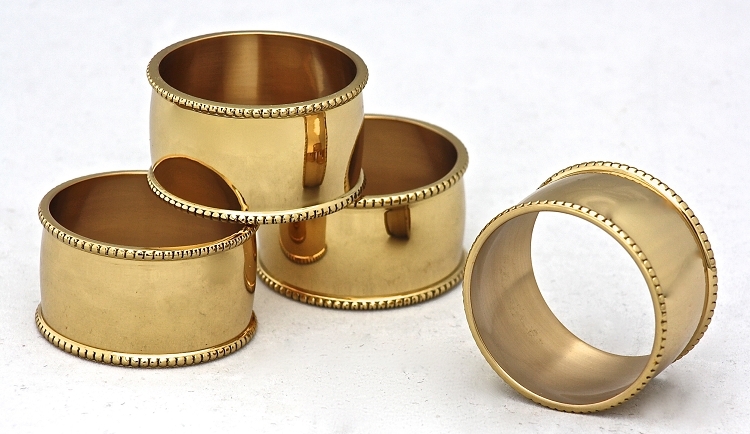 The solid brass napkin rings are about1 1/4 inches tall, and weigh 2 ounces per ring. The brass is lacquered to prevent tarnishing. Sold as a set of four. Also available in our Silver finish. New to our tabletop collection, these substantial napkin rings are large enough hold the heaviest napkins. This lovely set of four napkin rings will make any table look festive.